I am so thankful to work in a relatively casual work environment. I mean, technically it's business casual, and I do have to wear the occasional suit (like twice a year), but in general it's really laid back. Especially in the summer when no students are around (I work on a college campus) - most people women are rocking tanks, flowy skirts and strappy sandals. Now that we are well into fall, I need to dress a little more appropriately, but I've been wearing these pants to work a lot. Yes, they are jeans. But they are gray. And I am pregnant, so I somehow feel that I can get away with a lot when it comes to clothing. Other than crop tops, of course. I'm loving the gray jeans trend. This outfit is super cute! I don't know if I could do a capsule wardrobe. I think it would drive me crazy not having as many choices (but I guess that's the point, right?). I love gray jeans! Glad your still fit! I remember getting to that point! 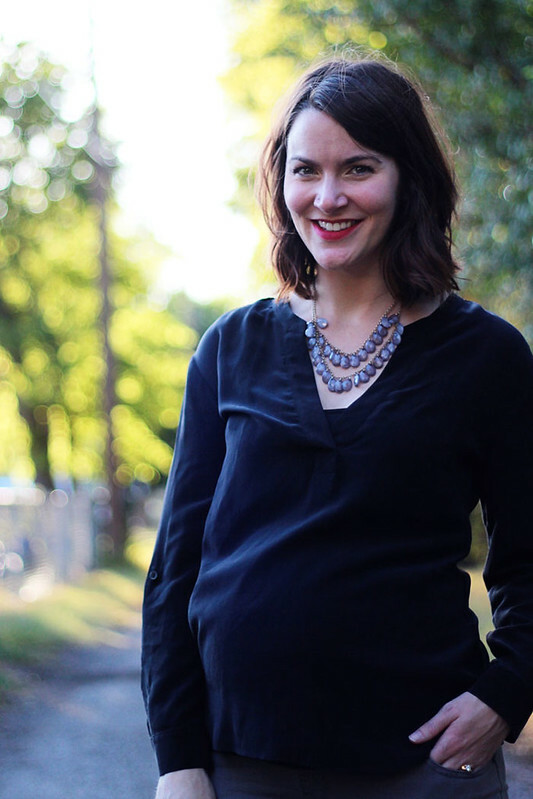 I'm obsessed with Caroline's blog and the idea of a capsule wardrobe, but unfortunately I just don't think I could do it (I have no willpower). But I still love seeing people do this and I think you're super smart to get as much out of your maternity pieces as possible. Love your gray jeans & your necklace is so pretty!! You look great. As someone who is a fan of tiny houses, it probably won't surprise you to hear that I LOVE the idea of a capsule wardrobe! 37 pieces per season sounds like a lot, but I bet if I counted my individual clothing items I'd be surprised at how many I actually have. 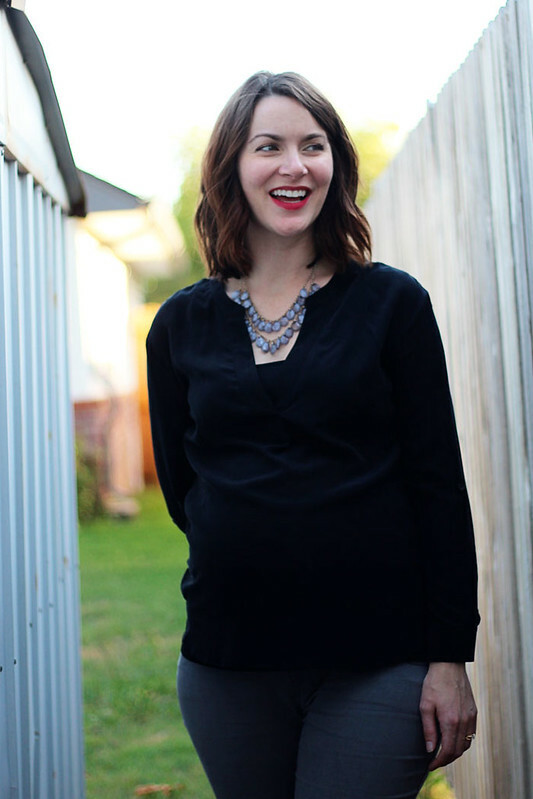 Love the outfit - women in their 3rd trimester deserve to be comfortable, especially at work! I love the gray and black combo, and you accessorized it perfectly - the necklace and flats make it into an *outfit*. Use the pregnancy excuse as much as possible! It definitely works for clothing. Those are really cute jeans! And 3 pairs of pants could work especially with dresses thrown in there! I'm pretty sure it is a rule that the pregnant lady can do what she wants, right? Love the grey jeans and your necklace! I am tempted with the capsule wardrobe as well. I have been reading a lot about it, but I think I would do one for fun and one for work, and when I am pregnant I will totally wear jeans to work. Don't argue with a pregnant woman, mmkay. I think I have about the same number of pants that fit me! I just can't spend money on maternity clothes that I won't be wearing much longer. I am living in leggings and skirts lately! 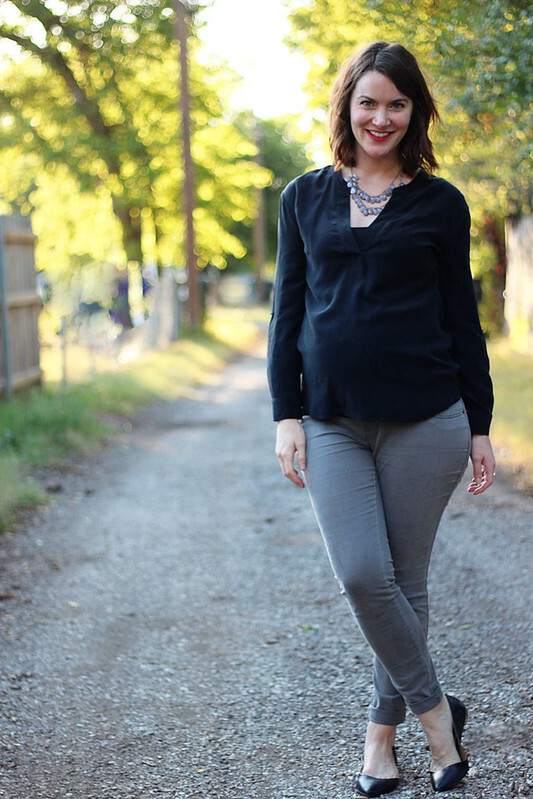 I'm very excited for my grey jeans this fall - I want to wear them with everything! 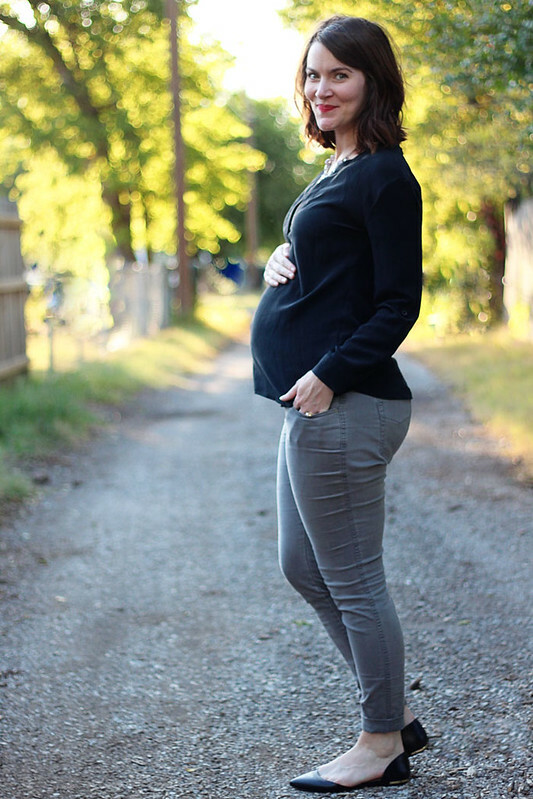 I think you can still look very professional in denim, and it would just be wrong to give a pregnant lady a hard time about wearing the only pants which fit. I'm totally in the same boat! It really is SO amazing how decently I can dress with so few options. I'm really wanting it to get colder here, though, so I can add cardigans and sweaters to my wardrobe. In my last month of pregnancy I started coming to work in sweatpants (nice sweatpants) and a blazer. Basically that's all that fit anymore and I'm pretty sure that my bosses knew not to say a word! You look fantastic! Love this outfit - those jeans are super cute! I would say 3 pairs is plenty when you're almost there anyhow!! I've been reading a bit into the capsule wardrobes, it's pretty interesting!! Looks like your pregnancy is giving you your own little style challenge, 3 pairs of pants x however long you have left! Somehow I think the only way I will actually get myself to do a challenge is out of necessity, like this!